The refrain of “Welcome to Seton Hall” has been shared on many occasions with scores of students who have ventured through the front gates of the school over the last 160 years. Although such a salutation can come at any point in time, early September just before Labor Day (or late August over the last decade in particular) has traditionally been designated as the dawn of an academic year for college bound individuals across the country with Seton Hall being no exception to this traditional rite of passage. Prior to the moment of entry, plenty of preparation faces the undergraduate student from the Freshman who encounter a number of Orientation Sessions prior to attendance through Seniors who are making their final semester opening appearance on campus. The fine tuning of course selection, purchase of school supplies, bracing for “Move-In Day” and other time honored and timely rituals are often routinely encountered by young scholars across the board. Once arriving on site, the student body is busy settling in, meeting roommates, making friends, selecting activities, studying course syllabi, book purchasing, and balancing meal plans among many other tasks start in earnest and helps to define the semester that lies ahead for each budding Setonian. Reflection of these moments are often special to those who lived through these new experiences and many alumni have kept enduring memories of their first time on campus. With this in mind, the literature produced by the school each term reinforces the structure and substance that goes into planning for a starting term from the first onward. 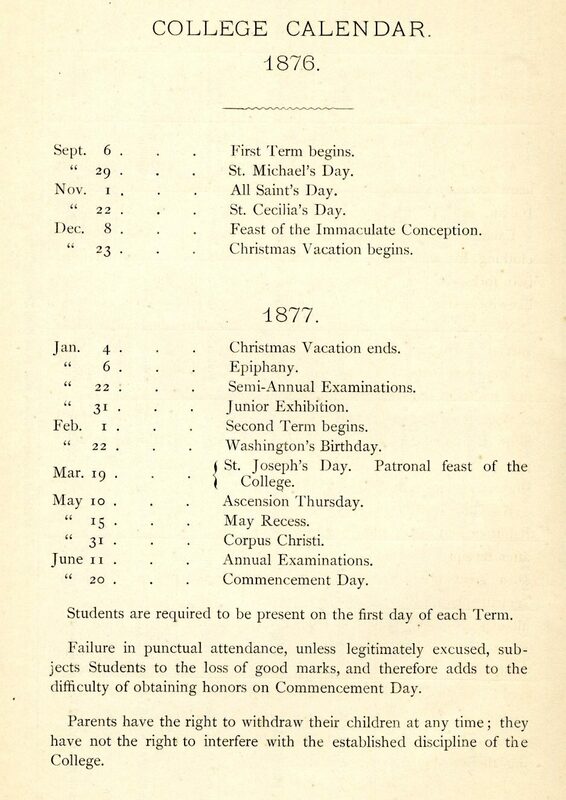 The first day of classes ever at Seton Hall came on September 1, 1856 in Madison, New Jersey (prior to the move of operations to South Orange four year later) when a total of five students enrolled at the fledgling institution after paying their room and board of $200 per annum. The original attendance roster included the following names – Leo G. Thebaud (Madison), Louis and Alfred Boisaubin (Madison), Peter Meehan (Hoboken), and John Moore (New York City). This number rose to 11 by the end of September and either by on-time registration or those who chose delayed enrollment, the school was now in operation and set the trend for first days to follow thereafter. For example, attendance figures for registrants to open a fall school term rose to 105 by 1865-66 and fluctuated below or near this number through the remainder of the 1800s. 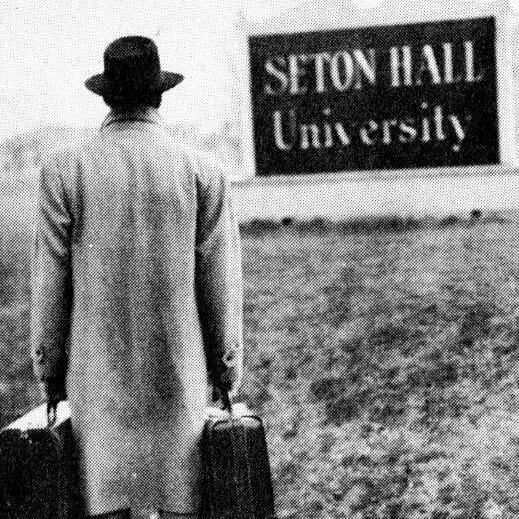 An upswing figure-wise came during the 20th century as Seton Hall boasted over 200 newcomers for the first time by 1925-26 (259 total) as a prelude to the era of four-figure registrations which came about in 1938-39 when the Urban Division (Extension) Schools of Newark and Jersey City featured 1,025 students (481 at the South Orange campus) on their books. However, it would not be until 1945-46 when the main campus hosted 1,008 new students (2,109 at the Urban Division) and the year following exploded even further in terms of Setonians who first arrived on site with 2,994 and 3,312 attending classes in South Orange and at the Urban Division respectively. Thousands more per year and in sum thereafter have also experienced their first day in building a tradition that has endured to the present day. Various resources trace the beginning of each semester through the finish are available for research purposes here in our collection. For more information about University History from start to finish please feel free to contact Alan Delozier, University Archivist via e-mail: alan.delozier@shu.edu or by phone: (973) 275-2378. In the meantime, a perpetual “Welcome to Seton Hall” everyone!